I wish I had this data when I was launching social media at Hitachi, sadly, I focused on tools first, rather than first focusing on how people used technology. Forrester has a lot of data, I learned in new hire training that we deploy the most surveys second to the US Census. On it’s own, data doesn’t mean anything, so we have made the information (when it comes to social media adoption) easier to understand using technographics. Colleagues Josh and Charlene are sharing Forrester Research survey data on the Groundswell site. You can now find out the Technographic data by different major countries, segment by age, and gender using a flash engine –at no cost. First, understand that Social Technographics classifies people according to how they use social technologies, read these 8 slides. Next, go to the profile tool, and experiment with many of the drop downs and toggles. Then, you can determine which social media tools to use, based upon understand those you are trying to reach. It’s always dangerous to build your house starting with a hammer (tools), first, figure out who you’re building it for, then build a plan. 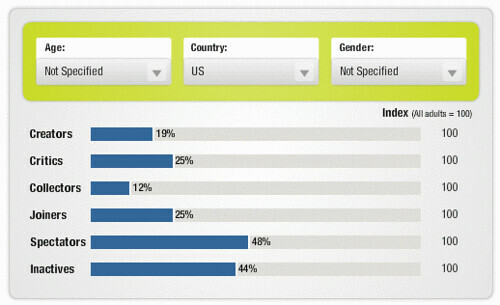 US: Forrester’s North American Social Technographics Online Survey, Q2 2007, 10,010 respondents. Europe: Forrester’s European Technographics Benchmark Survey, Q2 2007, 24,808 respondents. Asia Pacific: Forrester’s Asia Pacific Technographics Survey, Q1 2007, 6,530 respondents.